Trace lives smack in the middle of picture-perfect suburban Winnetka, Illinois. But her life is anything but cookie-cutter normal. Her mom, Bebe, is a zillion years younger than the other mothers, still dresses like a teenager, and drives around town cranking time-warped tunes-not to mention the fact that she can't seem to forget that crazy summer she spent following the big-hair bands of the 1980s. She's held onto the mementos, the music, the memories...everything, except Trace's dad. Trace can't help but wonder which outdated rocker in the autographed photos covering their walls might be her father. And that's not the only thing making her head spin like Bebe's old records. She's trying to keep her best friend from going off the deep end. She's desperate to do well in school. And then there's the hunky lead singer she's trying to snag-without following in her mother's footsteps. 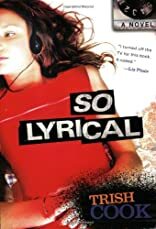 About Trish Cook (Author) : Trish Cook is a published author of young adult books. Some of the published credits of Trish Cook include Overnight Sensation, Overnight Sensation, So Lyrical.